Clearly from reading my blog, you can work out I love my iPad. Hopefully, you can also tell from reading my blog that I am also not a slavish “Apple Fanboy” who never finds fault with the product. Over the last year, I have been experimenting with the iPad extensively ( some would say obsessively) to see if I can completely do away with needing a laptop and relying exclusively on my ‘magical tablet’. As a teacher with ‘many hats to wear’, I rely on access to many computer dependent tools to complete my day to day responsibilities. What I have concluded is that if I was completely independent in carrying out my teaching, I would be almost laptop -free. Because I have to work within the constraints of a shared school environment, though, the iPad still had a little ways to go before it can completely replace my trusty MacBook Pro. The actual user experience of Google Docs spreadsheets on iPads is a pain and most teachers at my school would not put up with the glitchy workarounds I use to make the assessment spreadsheet we use on laptops workable on the iPad. Proprietary software like school reporting programs and on demand testing programs generally won’t work on an iPad without mirroring from another computer (which obviously means still needing the computer!). Spreadsheet apps have limitations that don’t recognize high end functions on Excel which means some spreadsheets become unusable if originally created on a Windows/Mac computer. Therefore, in terms of individualized assessment procedures that collect really useful data, the iPad can be a standalone tool. Sharing school resources? Not so much. Proxy server issues with certain apps like Dropbox and Evernote aside, which apparently will disappear when a new system is commissioned next term, accessing, updating and saving files has not been an issue. I very rarely use my laptop to read, edit or create documents anymore, unless they were created with a program incompatible with iPads. The teachers I work with use a combination of Google Docs, Dropbox, Edmodo and our school network to save their documents, all of which are accessible through my iPad through the Internet, their own iPad app or through Filebrowser for network and photo library access. All the apps I use can access these options either through the Open in… function, syncing options or in the case of Apple’s iWork apps, through Dropbox/Googledocs access via Otixo’s webDAV service. The only app that is problematic is GarageBand, which I still have to use iTunes file sharing with. ( Email is a poor option as is YouTube or Facebook for primary school setting). While sometimes I have to perform digital gymnastics to access some files via two or three apps like Goodreader and Filebrowser, it works for me. I’m going to do a post soon on Filebrowser specifically, partly as a lesson for my staff but also to share its features. There is also the option of using sendtodropbox service for apps that only use email for exporting. I really like it. Therefore, in my experience in terms of accessing compatible files, I can virtually put my laptop away and rely on my iPad. 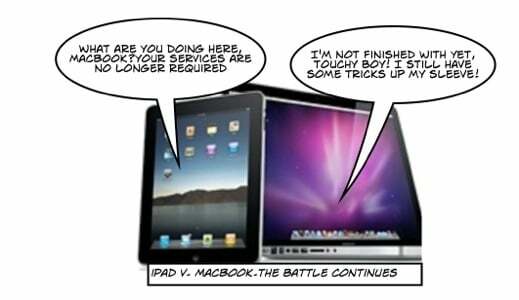 Despite protests from some in the anti iPad blogosphere, the iPad is indeed a fine content creation tool. I get the complaints about the keyboard ( personal preference and typing skill dependent) and the switching between screen issues ( I admit this bugs me) but that aside I think the complaints come down to what field of content creation you are in and how text typing dependent it is. For me I can create everything I need to support my teaching on my iPad. Attractive multimedia heavy documents and presentations are easily created through publishing apps like Pages, Keynote, ComicLife, Strip Designer, SonicPics, iDraw, Explain Everything et al, iMovie, GarageBand .. The list goes on. PDF annotation of texts for class note taking can take place using PDF apps like GoodReader or iBooks on an interactive whiteboard or projector/TV. Books for sharing can be created using Book Creator or Creative Book Builder. Lesson content and collaboration can be covered with the Edmodo app or Coveritlive. The biggest omission on the surface is the lack of compatibility with interactive whiteboard software such as ActiveInspire on Promethean Whiteboards. A plugged in iPad does not interact with the boards like laptops do because the touch based driver doesn’t support iPads ( any chance in future Promethean et al?). If I want to create flip charts, I still need my laptop to run ActiveInspire, however…. than a pen that has to touch the screen. Multiple iPad screens can be projected side by side for student sharing of their iPads. This could cut the cost of buying interactive whiteboards altogether and replace them with iPads and cheaper projectors and screens. The other option is using Splashtop Whiteboard (price has gone up since I bought it) to control the laptop screen through the iPad. In finishing, the question remains – How close to replacing a laptop with my iPad in my work environment am I ? ( I stress my environment because it is not feasible for all ). Not completely yet. And some of the workarounds I pull out to make some of the above possible is too much of a pain for less resourceful people. There are many days, though, that my laptop does remain in my bag untouched for the whole day. If I get AirServer installed on our school laptops connected to the whiteboards (at the moment I rely on my own ) , my laptop will barely see the light of day at school. I’m not abandoning the Mac platform. There are tasks I would always prefer to do on my Macs. I just want to carry less around at school and if the iPad can be relied upon all day until I get home to my Macs, I’ll be happy. It’s close to fruition. Obviously the solution is not for everyone and I would be interested to hear from others about their iPad experiences. Join the conversation. This entry was posted in A day in the life of an iPad at school, iPad, Teaching and tagged apps, assessment, content creation, Dropbox, Edmodo, file sharing, Flash, iPad, laptops, learning experience, Mac, network, PC, teaching by mgleeson. Bookmark the permalink. I too was trying to use my iPad exclusively. I ran into a couple of obstacles. The first was with Evernote. If I save a note in one of my notebooks it is impossible to copy it to another notebook on the Evernote for iPad app. The other probelm is more of an annoyance. When I use the Apple TV AirPlay-iPad combination the default screen from the Apple TV seems to be the Movies screen. This seems to only occur after some period of inactivity but it is a bit of a distraction to my students nonetheless. I agree wholeheartedly Google Docs (Drive) on the iPad is not quite ready for prime time. Also our district does not support the iPad nor wifi though a few of us are early adopters have our own ad-hoc wifi network setup. I’d love to hear any suggestions. I work to support schools with iPads and have been interested in your experience. I thought you may be interested in two free/low cost data collection techniques that populate Google Spreadsheets, using forms to collect data, that could be used for student assessments. There is the Forms App by NextBusinessSystems ($1.99) that connects Google Forms you have created with your iPad. Functionality is limited to what Google Forms can create. Mobile Forms by Device Magic is more useful as you can create forms on their web based designer. A single device account is free and a Google Spreadsheet is created in your account that matches the form. If each teacher had an account there is no cost. Nice range of form fields, so you can have picklists, checkboxes, radio buttons, calculation fields and also ability to capture photos and sketches, could be useful? Sounds interesting, Bill. We use Google Spreadsheets for collaborative online assessment in literacy. Are these apps or web-based? Could our spreadsheets be imported in or do we need to use their templates? And Mobile forms is free if we already have Googledocs accounts? does it render well on iPads? I’ve found using google spreadsheets cumbersome on iPads. Oh you should really considerate including Nearpod!!!! Perfect to create content, launch it on yours and students’ devices and assessment data is stored and can be downloaded!! visit http://www.nearpod.com you’ll like it! Sorry Adam. I can’t even get on demand testing to work on Macs let alone iPads, although apps that allow you to login to a PC screen are out there ( Logmein) but require a bit of expense and setup. Thanks for the reply. Yeah hmmm only down fall to my data driven school.